Cairn Law is a Seattle-based estate planning, business transition, and charitable gift planning practice. A new practice, Cairn wanted a website that would set them apart from other attorneys in their area, and communicate their goals of personal, affordable counsel for middle-class families, small businesses, and nonprofits engaged in philanthropy. They needed a business name, logo, tagline and website, as well as business cards and other marketing collateral to help launch the practice. The website’s color palette uses calming blues and greens and is interspersed with images of the area they serve. Written content is loaded with keywords to support the site’s SEO-friendly structure. 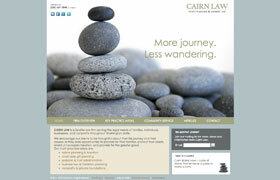 We helped Cairn purchase an additional domain to assure people can find the site, even if they misspell the name. Google Analytics will be used during the site’s lifecycle to make future decisions on content placement. A blog area gives the attorney an opportunity to make his voice heard and to publish articles of interest to his client base.